This is your brain on Shamanic Journey Meditation. I’ve recently been asked to explain the difference between Shamanic Journey meditation versus “regular” meditation. There is indeed a world of difference. A quick search on the internet will yield countless articles discussing this, but I’ve tried to briefly summarize some of what I’ve read, discovered, and come across over the years, and also to outline some of my thoughts on these differences and the unique, and active, connection to spirit that Journey Meditation offers. Scientific studies have been conducted to assess what state the brain is in during the two different types of meditation. This is performed by calculating the electrical output of the brain using electrodes; then measuring, and classifying, the brainwaves. Beta: this is the most strongly engaged and conscious mind. The person could be in fight or flight mode, be in a deep and complex discussion or debate, or be working on a complex task that requires intense focus. Alpha: this is a relaxed yet engaged mind. Alpha waves move more slowly than Beta waves. This person is relaxed, maybe taking a break after working on something that required intense focus. Theta: this is a mind that is on auto-pilot; perhaps engaged in a simple task like loading the dishwasher, but thinking about the next art project they might create. Or perhaps driving a familiar route home but thinking about something else entirely, however the brain is active. And finally, Delta: the slowest brainwave state. This is the state someone is usually in when they are asleep, or dreaming. The brain, when in REM sleep, can slip back and forth between Delta and Theta state depending on how engaged the person is in a dream (a particularly intense dream for example can pull a person from Delta to Theta, then as things calm they can slip back to Delta). During “regular” meditation the brain slips into a Delta state, but during Shamanic Journey meditation, the brain slips into Theta state. Several studies have been done, one by Stanford University’s Center for Computer Research in Music and Acoustics, testing the effect of drumming that has rhythmic beats at the rate of 4 to 4-1/2 beats per second. 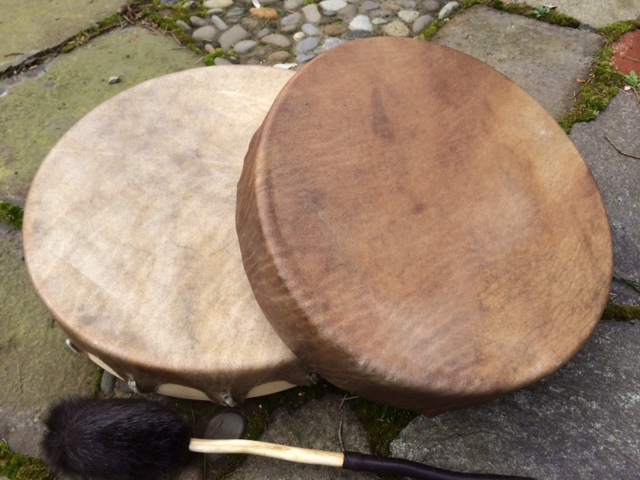 The Stanford study, among others, concluded that this drumming temporarily changes brainwaves to Theta. So what does this mean? Theta brainwave state is known to foster creativity. It is that space between being awake and being asleep. Personally, this is where my faint clairaudience sometimes kicks in. I think of it as the state where there are no barriers between the spirit world and our brains (my lovely, logical, western brain that can’t stop looking up articles discussing brainwaves to explain some things). Which brings us to inspiration, imagination, and creativity. The western mind has a huge problem interpreting imagination as anything other than make-believe and fantasy. This is not true of many other cultures and belief systems – Aborigine and Buddhist belief systems are two examples. The concept of what is imagined as a form of reality is a hard one for the western mind to grasp. One way might be to think of scientific hypothesis. A scientist comes up with a theory and then either she, or another scientist, proves the theory. The scientist’s mind presented a truth even though we were initially labeling it a theory. And what is the inspiration for imagination and creativity? Where does it come from? This is an another age old question that countless philosophers and psychologists have tried to answer. Entering into a theta state the mind is open, aware but at rest; there are no pesky barriers of consciousness throwing up “rational” road blocks for what presents itself. Some believe, as do I, that we connect to spirit in this state and then the mind interprets this connection and translates it via imagery formed through the imagination – we receive imagery. When we engage in Journey Meditation we always start by imagining the place to “go in.” Imagination is the bridge between ordinary and non-ordinary reality. This is how we open the door to Spirit. And finally – Spirit itself. We all should decide for ourselves what our idea of Spirit is (or isn’t). Through Journey Meditation it is possible to further refine these ideas through personal experience. Great knowledge, great healing, great love, and a sense of well being and care are available to us all. We just have to bridge that gap. Brainwave Entrainment to External Rythmic Stimuli: Interdisciplinary Research and Clinical Perspectives (abstract), by Melinda Maxfieid, Ph.D. – Stanford University’s Center for Computer Research in Music and Acoustics.